I’ve had a Granberg Alaskan Chainsaw Mill MKIII for a little over a year now, but apparently haven’t posted anything about it here. This isn’t going to be a detailed review or anything like that. I just wanted to post some pictures of my set-up. I will say that the Granberg mill is a well made, robust, easy to use piece of equipment. 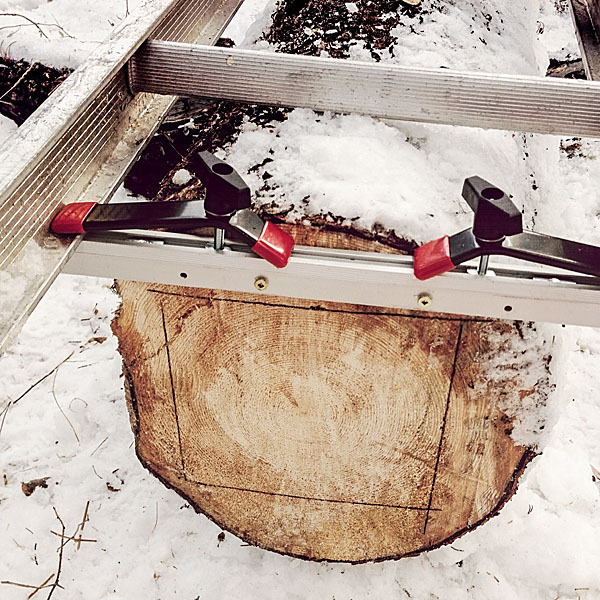 For what it is — a portable chainsaw mill — I have no complaints. Highly recommended. I do wish that Granberg’s EZ Rails (which can be used to make the first cut) were cheaper. 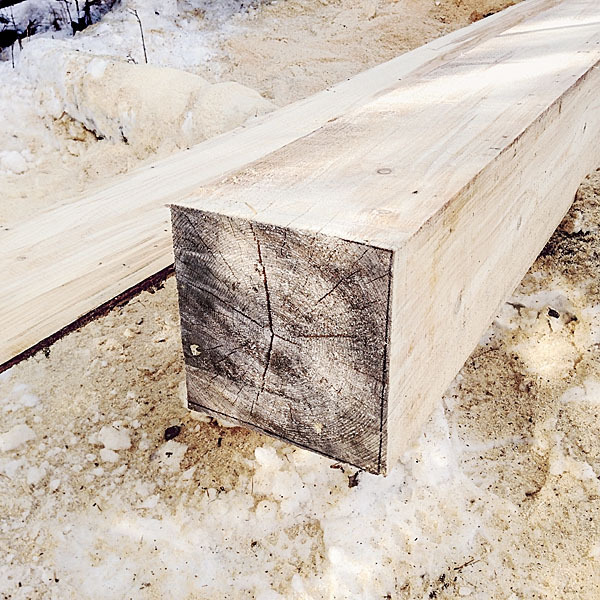 I am mostly using my mill to make lumber for timber-frame construction. As such I often need beams of 14′ or longer. The 9′ plus 5′ EZ Rails would cost me about $400. I initially made my own level-adjusting rails using 2x4s and some aluminum stock. However, the 2x4s have warped and I no longer use them. Instead, I made new rail brackets with integral quick clamps (see the photos) that work with an aluminum ladder. This set-up works quite well, though I am limited to milling logs about 13′ in length by the 14’/28′ extension ladder parts I currently have (I could get a 16’/32′ ladder, but can’t justify the $300 expense). I always find that the set-up for the first cut takes quite a bit of time. And since I am making squared timbers, I have to do the first-cut set-up twice. 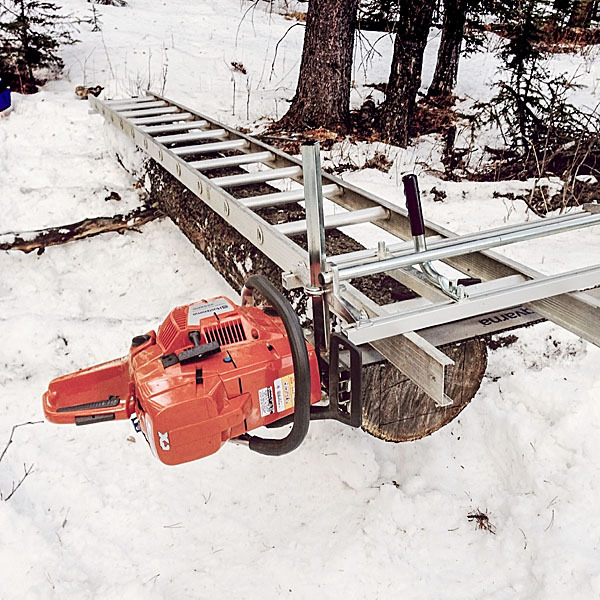 I run my mill with a Husqvarna 395 XP (7 hp) chainsaw, a 36″ bar, and skip-tooth chain. Before I got the bigger saw, I ran the mill with a Husqvarna 545 (3.35 hp) chainsaw, a 24″ bar, and a chain modified for ripping. 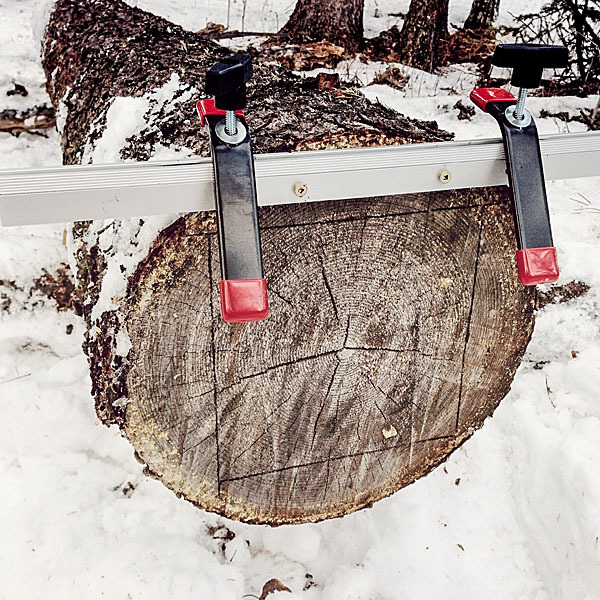 However the 545 didn’t have enough power to efficiently get through logs bigger than 8″ diameter. The 395 has plenty of power and I will probably never need the capacity of the 36′ bar/mill as trees just don’t grow that big on our property. I took these photos yesterday. The temperature was about 7°C. There was zero wind, a bluebird sky, and ravens soaring through the trees. The snow is very deep this year (near mid-thigh in some places) and I had a bit of trouble getting the quad into the bush to get at the log I wanted to work on. I managed though. 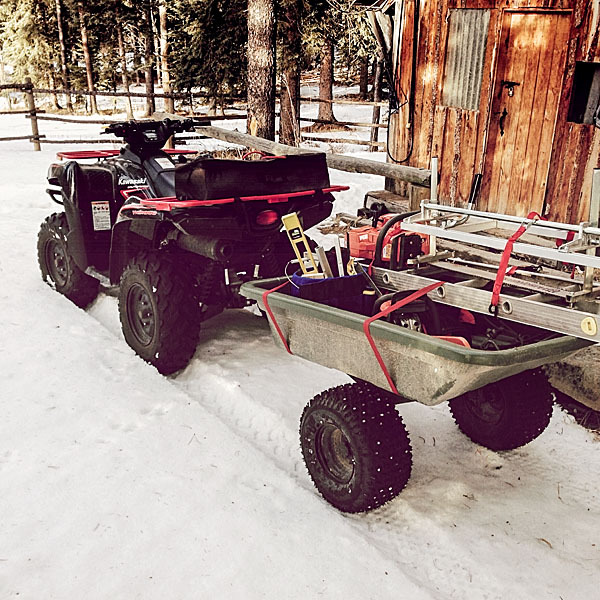 I like the system I have for hauling the ladder, mill, saws, and other tools in my quad trailer. After milling the log I covered it up so it is not exposed to weather. It is down a small hill and I will have to wait a few months until the snow melts a bit to winch it out of there.